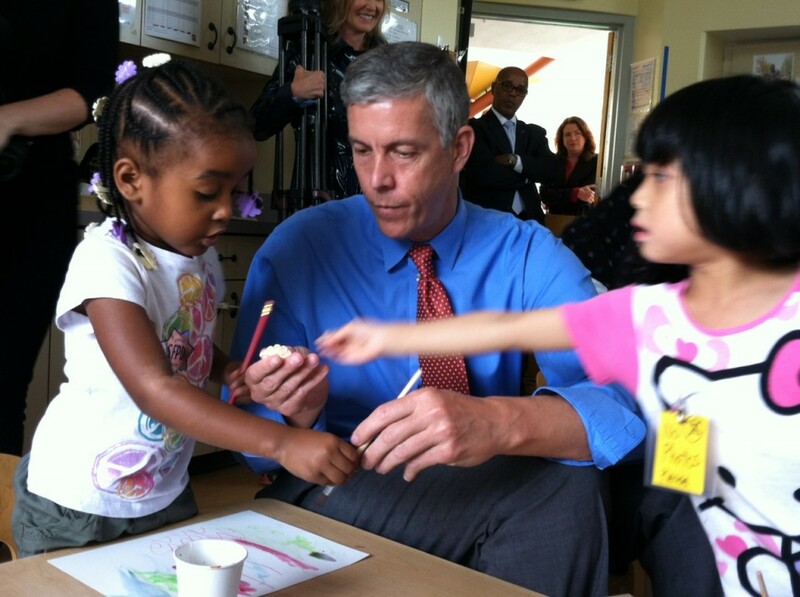 Education Secretary Arne Duncan visits a San Francisco preschool. Mattilyn Gonzalez is a thriving student, who has earned straight A’s and a spot in an accelerated learning program at her middle school. Her parents, Orlando and Celine Gonzalez, trace that success back to a strong preschool program – so they were determined that their second daughter, Arianna, would get the same opportunities. These are the kinds of opportunities every child in this country deserves – because quality preschool has been proven to help children get on a path to success, not just in school, but in life. Unfortunately, efforts to expand preschool and other educational opportunities could be at risk, amid a debate over renewing America’s most important education law, the Elementary and Secondary Education Act (ESEA). Expanding opportunity is a core priority for the Obama administration. This week, President Obama released his budget, which includes the Preschool for All proposal, investing $75 billion over 10 years to provide high-quality preschool programs for all 4-year-olds from low- and moderate-income families in every state. The budget also includes more than a $600 million increase for grants to encourage states to expand access to high-quality preschool. And expanding opportunity is essential to our aims for a responsible reauthorization of the ESEA law. ESEA stands as America’s statement that a high-quality education for every single child is a national interest, and a civil right. The law has boosted funding for schools in low-income neighborhoods, put books in libraries, and helped ensure that minorities, students with disabilities, those learning English, those living in poverty, and others who have struggled would not slip through the cracks. While the attention NCLB brought to the needs of vulnerable student groups was valuable, its prescriptive and punitive interventions have left it reviled by educators. Since then, and especially over the last 15 years, amid a bipartisan agreement to focus strongly on students’ learning, progress has been significant. Since 2000, high school graduation rates, once stagnant, rose almost 10 percentage points, to an all-time high. A young Hispanic person is now half as likely to drop out of high school, and twice as likely to be in college. Just since 2008, there are a million more black and Hispanic students in college. These are meaningful steps toward the day every single child in this country – whether she woke up in a homeless shelter or a migrant laborers’ camp or a leafy suburb – has access to a solid education. Yet Republicans in Congress have released a discussion draft of an ESEA bill that should worry anyone who believes that this entire nation has an interest in the quality of children’s education. Few would question that No Child Left Behind – the most recent version of ESEA – needs to be replaced. While the attention NCLB brought to the needs of vulnerable student groups was valuable, its prescriptive and punitive interventions have left it reviled by educators. It’s time for a new law. Recently, I laid out core ideas for a new law that ensures real opportunity. A reauthorized law must expand access to quality preschool so that families all across the country like the Gonzalezes can be assured that their children have every chance for a strong start in school and in life. Early education is an area that enjoys widespread support from Republican and Democratic leaders alike. Law enforcement officials, members of the clergy, military leaders, CEOs, parents, and educators almost universally agree that investing in early childhood education is a vital step toward securing the future success of our children and our nation. And the unmet demand for high-quality early learning is enormous. Here in Los Angeles County alone, there are more than 33,000 four-year olds who do not have any access to preschool. A new law also must expand support and funding for schools and teachers. President Obama’s budget will call for $2.7 billion in new funding for ESEA, with offsets to ensure we don’t go back to taxpayers for a dime. It must help to modernize teaching, through improved supports and preparation. And it must continue to enable parents, educators and communities to know what progress students are making – and ensure that where students are falling behind, and where schools fail students year after year, improvement will happen. Knowing what progress students are making, in a useful way, means states need an annual statewide assessment. But we must ensure that the tests – and test preparation – don’t take excessive time away from classroom instruction. Great teaching, not test prep, is what engages students, and what leads to higher achievement. There are a few questions we must ask ourselves as we decide the fate of this country’s education law – and our children’s educational opportunities. In making choices for our children’s future, we will decide who we are as a nation. For the sake of our children, our communities, and our country, let’s make the right choice. Arne Duncan is the U.S. Secretary of Education. Information about ESEA is available at ed.gov/esea. Arne – the eagle rules. In this case, an American ruler that dispenses alms to those who bow down in submission. “It is the “hard bigotry” of poverty and racism that handicaps students.” – Gary R.
There you have it. It’s racism and its progeny, poverty, that’s the cause of low performance. Racism has little to do with test results. Subgroups of every race excel because they believe it is important and sacrifice the effort and time necessary, as parents and as children, to make it happen. Nigerian, most Asian groups, Cuban, Lebanese, Persian, Russian, Jewish. Racism may cause isolation and lack of role models, but when those role models are available they’re rarely availed of, as almost all Californians have some driven kids in their school they ignore. It isn’t racism and poverty is a minor factor. We buy breakfast and lunch for most poor kids twice, food stamps and school lunches, on school days. Food stamp quotas do not deduct for school lunches, so families can keep the extra money for snack food. Effort is a much bigger story than poverty but generally ignored. Do nothing to fix it for 6 years and counting. There are some surprisingly enlightened suggestions for a new ESEA in this letter, which suggests someone beside Duncan must be responsible for most of the key points. There is NO empirical evidence to suggest schools have failed students. Find one of these “failing” schools in a middle-class or better community. It is economic well-being, and all that is associated with that, that is the main determiner of student school success. It is the nation, the states, and communities that have failed students year after year. Of the major industrialized nations (33 identified by the OECD) the US is #32 in percentage if kids living in poverty. A recent report asserted half the nation’s students live in poverty. (CA is noted as the state with the most poverty.) Researchers suggest no more than 1/3 of school “achievement” is related to the school, 2/3s to home and community. The one third tail is not going to consistently wag the two thirds dog. The sanctions attached to NCLB certainly created much of the disdain for the bill, but it was the testing that was the most egregious insult to real education. To keep up the testing, but remove the conditions that demean instruction, is an oxymoron. Oh, come on. Even Arne out to be able to come up with something more fluent than tired Bush slogans. It is the “hard bigotry” of poverty and racism that handicaps students. Bad news for the USDE here., NCLB was a great example of “bi-partisan” agreement. “Bi-partisan” may well be the most abused of all political shibboleths. Gary, you said there’s ” some surprisingly enlightened suggestions”, but failed to mention any of them. You did, however, point out the errors in three of Duncan’s comments. I’d like to ask you – if schools don’t fail students, what is the rationale for sinking billions of dollars into the low performing schools and education instead of social services? According to your logic, it would seem more appropriate to sink money into the family and the community, the primary drivers, if indeed money changed those factors, as it clearly hasn’t helped the schools. If other out-of-school factors are more important than in-school factors than we should focus on those. Can you name an instance of a school system that truly sunk large amounts of money into low performing schools – with enough money for enough time to make a substantial difference? I think the points that a few thousand dollars per student isn’t really enough to offset the disadvantages of being in an extremely impoverished situation, along with the fact that rarely do we allow these experiments to last for even one batch of students to experience it K-12, are both important. Certainly it’s possible to waste large amounts of money. But I also can’t help but notice that when rich people choose private schools, they choose schools that are way more expensive than your typical public school, and they choose schools with low class sizes and amazing facilities and incredible field trips. There’s some amount of money, spent wisely, and spent early enough, that would make a big difference. It’s probably more than we’re willing to pay, when scaled up. But to pretend that more money won’t improve the lives of needy kids is sophistry. el, back before Geoffrey Canada got into hot water for kicking an entire class out of his charter schools, he mainly advocated the use of wrap-around programs to offset the effects of poverty. Such things as parental training, quality pre-k, etc. So, yeah, it is all about money and other resources concentrated on poor communities over a sustained amount of time. The fact that Canada’s org essentially gave up on those kids speaks volumes. In such situations most of the money most of the time is wasted and embezzled — the poor districts rarely have the mechanism to keep track of the money or make sure it is applied for student benefit. The article in my link specifically addresses Camden. Says the unbiased Union Rep whose stated mission is to protect teachers from criminal and professional malfeasance rather than promote kids’ interests. You are being silly. Again. Collective bargaining rights, as enforced by unions has nothing whatsoever, to do with criminal prosecutions. Even you, steeped in “Reason Magazine” and think-tank [sic] press releases masquerading as “studies” should know that. The one important similarity is that is personnel charges of “malfeasance” (that term is not really meaningful but I get your drift) as well as criminal charges have important requirements around evidence and due process to be considered valid in our system. Those values are encoded in the US Constitution. It is evidence and due process that those who have declared war on teachers working conditions, as well as student learning conditions, are most desperate to eliminate. While we are on the subject (or so it turns out) of education in New Jersey, we should note that that state, in spite of the governor’s best efforts (he who thinks student inoculations should be an “option”), still spends considerably more than CA and many other states. Camden is a story where, for various reasons, things have not gone well. But nearby is another city and a school system where things have gone phenomenally well. As recounted (actually there’s an article in the archives of this site) by Prof David Kirp in Improbable Scholars, the district in Union City NJ has done much to close the “achievement gap” and is using the generous funding to great effect. Kirp asserts that the essentials of what makes Union City successful are “familiar to any educator with a pulse.” This might explain why Reason Magazine (Free Minds and Free Markets-Wheee!) took no note: they are not educators and as to the “pulse thing,” who knows? In Union City Schools you find: high quality pre-school; “word soaked’ classroom (not phonics worksheets); true bi-lingual education for EL kids, consistent and coherent curriculum, tests used to diagnose learning issues, teachers involved in continuous learning, schools actively enlisting parents as partners; and, schools that maintain a climate of high expectations, caring, and trust. Kirp also talks about what does not work: distrust leaders “long on pressure and short on supports;” mass firing of teachers, closing schools; Teach for America; and charters. These are all things that work, or do not work. The things that work, and the necessary funding and management that supports them, will be rigorously denied by the self-styled reformers. The things that do not work are just another way of talking about the pseudo-reforms of the self-styled reformers. Another example of Ed Source left-wing bias…. but I’ll get to that later. I found Duncan’s appeal rather political and cheap, including a craven and back-handed use of the race card to instill fear. It’s interesting how so many on the left support massive Federal intervention into public education but then hail local control. How can Duncan tell us with a straight face about the “prescriptive and punitive” NCLB law, when he as head of the DOE personally employed prescriptive and punitive measures to push upon the states his own reforms – reforms never passed by Congress. Remember RTTT? Now he uses NCLB as a strong-arm lever handing out exemptions to those states that comply with high stakes testing “recommendations” linked to teacher evaluations, and other “reforms” straight out of the corporate reform playbook. Duncan’s two-faced tricks didn’t escape my notice. He said. “Early education is an area that enjoys widespread support from Republican and Democratic leaders alike.” And then he blasts Republicans for calling early education optional. Got integrity? I’ll address each additional each point down Duncan’s list of Republican “optionals”. He says Republicans view as optional “statewide indicators.” This is a straw man argument. There’s little debate over statewide indicators, a euphemism for high stakes standardized testing, but a debate over de facto nationalized testing linked to de facto nationalized standards. He claims Republicans don’t support using federal funding allocated T1 schools only for T1 schools. What is Duncan suggesting? That’s an allegation that requires a little more explanation to have any credibility. Usually this sort of political battle is over handing out block grants versus categorical funding, just exactly what Brown has done with LCFF. I’m not falling for Duncan’s cheap political games. Regarding supporting local innovation by educators, again, who knows to what Duncan is referring? This is just snake oil. Maybe it sounds good to the uninitiated. Is he talking about some kind of federal largesse for teaching unions? Federally funded PD, maybe for those states that toe the DOE line. Is it too much to ask – what the hell is he talking about? Well, it sounds good which was its purpose. An ‘A’ for unfounded but effective political persuasion. Paste it on his lapel. And the coup de grace – “We cannot afford to replace “the fierce urgency of now” with the soft bigotry of “It’s optional.” OMG, I never liked Duncan from the start, but this is just disreputable. A++++ again! Lofty language is acceptable when the ideas are lofty. Instead, this is just the old tired race-card trick packaged in false rhetoric. If the Obama Administration had a sense of urgency why have they waited now over 6 years to recommend a replacement for NCLB? The answer is keeping NCLB and offering exemptions instead was and is a convenient and effective tool for Duncan to wield a truncheon over the states to compel them to accept the DOE/corporate partnership’s vision on public education without technically violating the legal provisions that prohibit national standards. This was one area where true bipartisan support made a new law more than feasible. No, there was more to be gained by keeping it. ????? Obviously, just to take a sucker punch at Republicans. Even if it was submitted in this format, which I doubt, the editorial staff should have removed it. Talk about flagrant bias. Ed Source, take a good look at yourself. EdSource is absolutely willing to accept commentaries from any perspective. Mr.Osborne, if you are responding to my bias assertion – that isn’t a response. Don is walking the bias beat again on EdSource. Since this piece is obviously and undeniably commentary, it does not fall into the same category as Don’s referenced “reporting” example. The billboard simply advertises Duncan’s bias in a snap shot, and commentary pieces are–by their very nature–advertising a writer’s bias. Commentary “billboards” are supposed to take the most outrageous or thoughtful or polarizing or summary positions to pull readers in. It may not always have that effect–to pull–but that is its job. Mr. Duncan’s piece is a commentary. Therefore, it is natural that the juiciest quote be used for that banner. Is that evidence of EdSource being a left-wing front? It is just a way of attracting readers to finish reading the piece. Indeed, we had “pollgate” recently and I can remember other commentaries that did not suit my personal world-view. Isn’t that what reasonable discourse in a free society is all about? Since you both find the use of the billboard only natural and appropriate, maybe you can explain why the previous ten commentaries on EdSource ( I didn’t bother to look beyond the these ten ) didn’t use banners or billboards? There’s no question that an article by the Secretary of Education is fair game to be published on an education media outlet. I’m glad Ed Source chose to publish it. But I do question whether it is appropriate to juice it up for the purpose of attracting reader interest. The banner employed here was designed to be incendiary and highlight what really is just a political snub, rather than highlight a thoughtful point. Do readers really need this kind of a journalism tactic to stay focused? I don’t think so, though maybe you do require it. I don’t know. That said, just because it is commentary doesn’t preclude bias. There are various forms as we know- omission bias, story selection, placement bias, labeling bias and others I can’t remember. But let’s just say there’s no bias or rather, only the inherent bias of the author. Often media outlets that concern themselves with balance present 2 commentaries in pro/con fashion. I’m not saying Ed Source is at fault for not doing that in this case, but it did willing choose to highlight an entirely unsubstantiated charge by the Secretary and give him a lift by so doing. Commentary in all forms–no matter how it is presented or formatted–is naturally and openly biased. Commentary cannot preclude bias. It is bias. I cannot explain why the banner is not there for the past 10 commentaries on EdSource, but most major news organizations use that style now in print and on the web. I personally do not like it because it treats readers as if they were morons who live and die by sound bites. Whatever the case, doesn’t your implication enter a minefield of fallacious territory anyway? Even if EdSource used four or five more banners and flashed them in different colors, including ads and sounds, I seriously doubt Duncan’s words would persuade those who are in the educational trenches anyway ( be they liberal or conservative). Duncan has some severe credibility problems with his doublespeak concerning NCLB reauthorization, the non-success of his RttT grants, his “white suburban moms” comment, the (probably unconstitutional) waivers his department handed out, his proposal to rate teacher credentialing colleges, and his new special education guidelines that lump all special education students together. By banner do you mean the pull quote in the middle of the commentary? I’m pretty liberal, in fact the only things good Bush did was NCLB and one nanotech grant, but Edsource has always allowed both sides to express themselves. In fact, liberal sites have completely banned me whereas Edsource has allowed me to speak without fear of censorship. I think it’s a free speech zone. If you have conservative friends Don, ask them to post, they will not be censored. We needed testing. We need to know the reason behind the achievement gap. We need to know why blacks are poorer than whites and segregated, why Asians rise through the ranks quickly. That’s how you get everyone to follow the best methods of child raising, teaching, everything. You shine a light on things and truth comes out. It takes a lot of truth. Most Americans are still deep in denial that kids can’t have a middle class salary and go to a good college if they study 5.6 hours a week, they look for the few exceptions, college dropout billionaires, entertainers, people with degrees working in bakeries at 40, to avoid the unpleasant truth that childhood in America is lazy and that makes us work more hours for less our entire adulthoods, so until we fix the tutoring and effort factors, we’ll have a huge achievement gap and 95% of good jobs will go to those born in the top 20%. No one wants to change, but Bush forced us to face unpleasant truths and focus on the achievement gap. The liberal group you want them to criticize Don is the union, but the union are not true liberals because they put an adult interest group ahead of closing the achievement gap and helping poor children overcome poverty via education, they are faux liberals, me me me people who use liberalism only if it suits them but don’t really believe in it. True liberalism gives an equal opportunity in life to the bottom 20% as it does to the top and prioritizes educational advancement. Those aren’t the priorities of the entrenched status quo. The rich and the poor and the union all want to see other priorities and no real hard change. NCLB forces us to consider hard change of what really causes this. It provides us all with facts which are undisputed. read the article for the context of this quote, which includes that most schools are too segregated to have any meaningful subgroups, and thus tend to be more resistant to these sanction criteria. But most of the focus school labels are earned by completely erroneous classification resulting from subpopulation size thresholds achieved through aggregation. As I’ve shown in previous blog posts, the schools assigned this distinction are nearly all “middle schools” in racially diverse school districts. Why is that? Why aren’t the elementary schools also labeled as focus schools? Well, that’s because the elementary schools simply don’t have enough students in the subgroup to count. But, when they all come together – perhaps from two or three elementary schools of about 400 kids, into a middle school of about 800 to 1200 kids, all of the sudden there enough to count. Nothing has really changed except that minimum subpopulation size thresholds have been met. The fact that the gaps are measured – and used to enforce sanctions on middle schools – is merely a function of aggregation. It’s meaningless, ignorant and data abuse. In the case of both the Hispanic and Asian/Pacific Island aggregate groups there are substantial, though not always statistically significant, academic performance differences among ethnic subgroups, with a range of math performance among Hispanic subgroups of 10.7 points (mean score = 34.4) between Cuban and Puerto Rican students and a range of math performance among Asian/Pacific Island students of 15.3 points (mean score = 41.0) between West Asian and Pacific Island students. Dang, sorry, I think we need a more mellow blockquote styling for comments. Didn’t mean to eat the page there. OMG that is not going to work! I’ll tone down the blockquote. Thanks for accentuating the worst in Duncan and helping to discredit one of the most unconstitutional and interventionist administrations the US has had the displeasure to endure. Even Gary, who said he agreed with some of Duncan’s suggestions, remarked about the cheap political rhetoric. At this stage in the admnistration the only people that like the DOE are the corporate reformers or those who are ignorant of what’s really going on. In an article you don’t have to keep a straight face when you express yourself. I guess that’s how Duncan gets away with naming his article “How Not To Fix NCLB” while giving us a Machiavellian lesson on the political benefits of not fixing NCLB. That’s assuming Duncan has any compunction at all for doing the opposite of what he prescribes. Don’t pull quote me. I’ll let me words speak for themselves. BTW, you should have highlighted your comment, John. True, our schools are segregated, but it is meaningful. If black kids in mostly white schools do worse than white kids in mostly black schools, and Asians beat both even when poor, maybe it isn’t that a school is good or bad but that the parents are good or bad, and the students. We know what parenting works, but we are still in denial. Instead of recognizing what Asians do right, we focus on the fact that some Hmongs and others don’t do it, but the info is there. We can learn from the parenting and focus, but we don’t. It is complex, but the answers on how to advise all parents to do what it takes to ensure their kids make the upper middle class are there for all to see. Some people are still debating whether divorce is bad for kids but every stat shows it is. The bottom line is as a society, and I am including whites in this, we care more about having freedom to do what we want and lack of pressure to work hard as parents and ability to put ourselves first or at least equal to our kids during childhood than we do about how successful our kids become, which is really in conflict with most of the first world now and most cultures throughout history, who felt there was a moral obligation to put the needs of children above those of adults. Yes, it’s complex, but that doesn’t blur the clear message, you just have to take every complexity into account. El, to what is your comment a counter? I’m not understanding the context of it in regard to the article. If you read Bruce Baker’s article, he suggests that the whole notion of subgroup statistics as practiced by NCLB is mush. 1. Differences within subgroups are as large as differences between subgroups – IE, do people who descend from Japan and people who descend from Hmong really have that much more in common than a comparison of people who descend from Japan and Germany? 2. Schools that are highly segregated are exempt from subgroup sanctions because their non-majority samples are too small to be statistically meaningful. 3. How you divide children (or add them) to create schools is perhaps more deterministic about whether your school will be sanctioned for subgroup issues than how you teach them. IE, a large, diverse school is very likely to be sanctioned – divide those same kids into say four smaller schools and all is good even if the test results are the same. There’s also more about the data malpractice of taking this continuous score data and changing it into ‘yes-proficient’ and ‘no-not-proficient’, then comparing counts. This is a fine political appeal by Mr. Duncan. I would expect no less from him. However, all the lofty goals enumerated can (and have been) derailed by the time they are delivered. Mr. Duncan chooses to highlight the need for quality pre-school and points out that poor communities should receive directed aid. Yet, current law allows the current federally funded program, Title I, Part A, to be distributed as the local district sees fit and there is no way to appeal this. Will the same happen with federally-funded pre-school? I don’t know, but I would not expect any difference. Mr. Duncan suggests that “we need statewide indicators of what progress all students are making each year.” Yet the indicators currently used do not measure grade level competency. How could they do so with 60 to 70 questions covering a year’s curriculum? They are nothing more than a stack-and-rank system which no citizen can truly question since the tests are, by and large, secret and their true results not available for inspection. All this is done, of course, to protect the safety and security of the test items as well as the often proprietary nature of the analysis of their results. What good are such tests when parents are told to “make sure your child sleeps well the night before and has a good breakfast the day of the test” if they want their children to do well? The fact that civil rights organizations have embarked the testing bandwagon is not proof of the tests’ worth. Rather, it is clear that political chits were cashed in. Where were these organizations when the test cheating scandal broke in Atlanta? Indeed, what happened in Atlanta is extreme but is not much different when schools devote considerable time to test preparation and only concentrate on the subjects tested to the detriment of everything else, even physical education. How can Mr. Duncan advocate for innovative educators at the local level when teachers are effectively slandered in court without recourse of confronting their accusers as recently observed in the Vergara trial? Sure, it is easy to blame the Republicans in Congress for suggesting that much of ESEA’s mandates should be optional. But that’s shooting fish in a barrel. It is harder to defend the policies designed to undermine public schools that are at the center of Race To The Top, Mr. Duncan’s signature achievement. Why is it that the only way to improve a school defined as “failing” by a dubious measure is to fire everyone in that school? Why is it that “failing” schools are invariably situated in poor neighborhoods that cannot defend their institutions as well as a middle class suburb can? I submit to the reader that platitudes about how bad Republicans are to public schools don’t hold much water when Democrats are helping to hold fire sales of the same public schools to charter management organizations. This ain’t no way to run a railroad and we are headed for the cliff, Kemo Sabe. It is popular among politicians to make programs like preschool, that are considered optional, means-tested. In my opinion, if we want every child to participate, we should have the goal of making it free and available to every child regardless of parental income. 1. Creating a program available only to low income children inadvertently segregates them. It accidentally creates a situation where the earliest friendships among kids and families are formed only with other people economically like you. The wealthy children in the area don’t get to go to playdates and birthdays with the lower income kids. The preschools are deprived of the resources and energy and support of better off families in the community. 2. In rural areas, like the one where I happen to live, it’s not necessarily a given that there is a private preschool alternative available to the means-tested preschool. In communities where 70%-90% of children are eligible for free or reduced lunch, there may not be enough higher income children to support a private preschool. Will those kids be fine? Most likely it will all work out. But barring these kids from participating seems nonsensical. Isolating them to only other kids of similar income levels seems like it could have impacts on a school district for the next 13 years. 3. Asking people to fill out financial paperwork to apply to school is inevitably going to prevent some low income and needy children from being enrolled, either because the parents can’t be bothered, have complicated finances, or have other issues with getting it completed and turned in by the deadline. If money is tight, and it always is, I would rather phase it in by area/community where a need is seen and make it available to all kids in that area rather than by parental income. Probably no one would argue that ‘knowing what progress students are making, in a useful way’ is beneficial. What many would argue is to what ends, and thus what ‘useful’ means. If the goal truly is higher achievement to the exclusion of test-taking time, then there is no reason to require every student in every grade to take every test. If the goal is, instead, to use test results to measure schools and their teachers for the ostensible and secondary goal of improving student achievement, then maintaining the current test regimen is a more complete way to achieve that. Make no mistake, however; these approaches are mutually exclusive. It is incongruent to claim they are not by implying a rigorous testing regimen can inherently improve student achievement while also making real teaching less possible. The goal of the federal DoE should be to support schools in their efforts to support students, not punish them into adopting politically appealing policies that come at their expense.